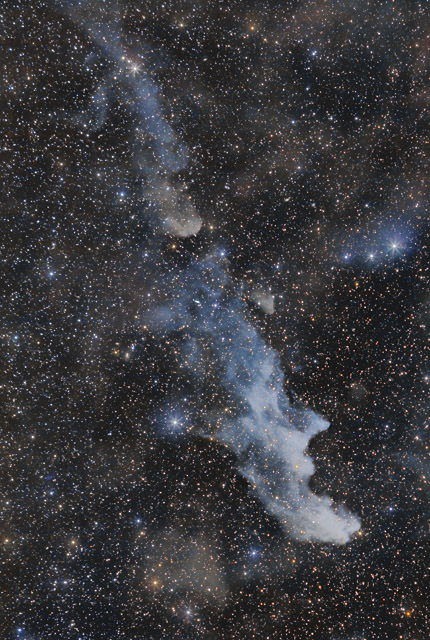 The Witch Head Nebula is an excellent example of a reflection nebula. The nebula is believed to be illuminated by the nearby bright star, Rigel. Because Rigel is very blue in color, the nebula appears blue as well. The 50 light year long nebula may have originated as the remnants of a supernova. The nebula is a rather large and a very faint visual object. The main part of the nebula spans approximately 3 degrees by 1 degree of sky and is nicely framed in this 5 degree by 3 degree widefield image. Careful inspection of the high resolution image will also reveal about a half a dozen nice background galaxies. Software Used Images Plus 5.0 for camera control, calibration, stacking, digital development, star shrinking and halo reduction, smoothing and noise reduction. Photoshop CS5 used for levels and curves, high pass filter, star shrinking, screen mask invert, lab color, vibrance, saturation adjustments, selective color, and match color. Gradient Xterminator for gradient removal. Carboni Tools for additional noise reduction, and smoothing. Registar for aligning stacks and for color channel alignment. Focus Magic for focus restoration. Notes I have wanted to photograph this target for quite awhile, but its large size was not practical with the limited field of view of my Celestron C-8. Having recently acquired my 200mm Canon lens, this object was high on my list to finally capture. I'm very happy with this result, as the nebula has a beautiful color and wonderful details. The horizontal version of this image won 1st place in Astrophotogallery.org's Medium - Nebula category for February 2013.